No update on iTunes accounts this time but there was a mid-year update (June 10th) which put iTunes accounts at 575 million. 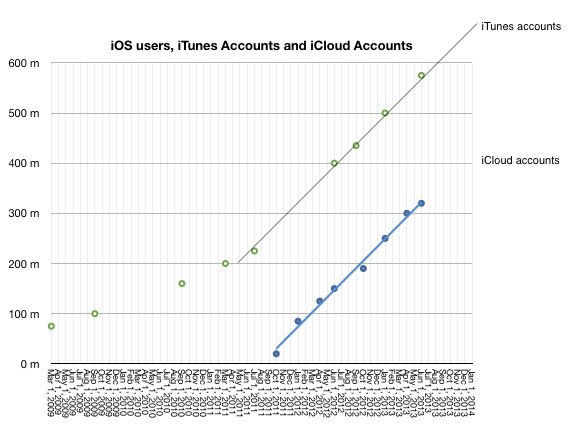 iTunes accounts have grown linearly since mid 2011 so it’s quite probable that the current total is above 650 million. 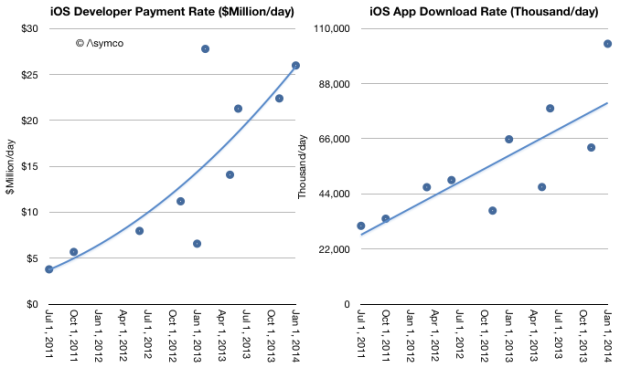 Given mid-year updates to earnings/revenue and the October 22nd update that 60 billion total apps were downloaded and the May 15th update that 50 billion total apps were downloaded it’s possible to estimate with confidence that there are now 68 billion total apps downloaded and that were about 27 billion app downloads in 2013. This is an increase of 35% in the yearly download rate. As noted above, the December growth alone was 50%. As other reports have noted, there was a decrease in music downloads in 2013. This is also evident when backing into a download total for music given the earnings data and the above evidence of app growth. My estimates below may be overly generous for music unit downloads as they also assume lower pricing. Overall gross music revenues through the iTunes music store2 are flat for the year and may even have begun declining precipitously. App revenues are more than compensating for this. The iTunes content economy is grossing about $17.5 billion/yr. Apple’s own software and services (reported as part of the iTunes segment) add another $6.2 billion/yr. The combined total of $23.7 billion/yr. is slightly lower than what Apple net sales were during its fiscal 2007 year or what Amazon sold in 2009. A complete report on the iTunes economy and pro-forma iTunes income statement is available for purchase at store.asymco.com. So much for the data. What is really happening? First, it’s tempting to look at music and suggest that music downloads are suffering from streaming, just as it was tempting to suggest that CD buying was suffering from piracy (and later, downloads.) But this is falling into the trap of defining a product’s use by the metrics used to measure transactions. These metrics are but a proxy for what consumers are actually doing with their time. Downtime or “boredom” was filled with app interaction. This includes some social media consumption. These are not immersive experiences. They are “casual”, inconsequential and trivial. At first anyway. And that’s the rub. As apps enter a consumer’s world they initially take on non-consumption, which is easy to beat. But as the experiences become increasingly compelling they “move upmarket” and compete more aggressively with existing media consumption patterns. For instance, one might allow casual gaming to take root in non-consuming contexts such as commuting, waiting, and escaping time niches. But if the experience becomes addictive, the gaming takes over time previously spent watching TV or using console games. The same can be observed for app-based experiences of social media, shopping and chatting. This is the insidious march of a disruptor. It gains a foothold in a context where it has no competition and then relentlessly gets better, eventually displacing the far better suited alternatives. This is what I believe is happening with apps. They are asymmetric in their competition with established media and as a result they are easily ignored and brushed off as irrelevant competition. That is until the incumbent media sees a sudden drop in consumption. Even then, the culprit blamed is not the upstart but some structural issue. Music would appear less vulnerable to this app-based substitution because it’s an eyes-free experience and can be easily consumed concurrent with another activity. There is however, a subtle de-emphasis and hence devaluation of the experience as it fades into the background. The “job it’s hired to do” changes. Second, and relatedly, the other meta-observation is that apps are media. They are produced, marketed and priced in ways analogous to other media types. This has implications for the artist/producer/creator. For them movement into apps is natural and effortless. It’s how developers moved into them without thinking twice. Trouble is that this transition is not at all simple for those who distribute media. I tweeted that the media industry deplored the shift of “digital pennies for analog dollars”4 as the packaging of their product changed. The angst and trauma suffered by the media industry when dealing with what could be seen as a trivial change in the encoding of content are the stuff of lore and legend. Moving to apps could be even more troubling. Mainly because there is already a distribution channel in place. And it’s owned by a set of companies whose motives and business models are completely different. The app economy shows that there are big opportunities in “digital pennies” and that the figures are beginning to match even the “analog dollars”. In fact, I suspect eventually digital pennies will dwarf analog dollars. The trouble is that these pennies will not be earned at the same control points. Bits are already big bucks. They’re just not the bits we are used to. ‹ Previous Post When will smartphones saturate?